Hi there! It’s a new month and time for a free printable and monthly update. If you are new here, welcome friend. My blog’s main focus is renter friendly DIYs and home decor. I am thrilled to have you here today. For this month’s printable I wanted to try something new. 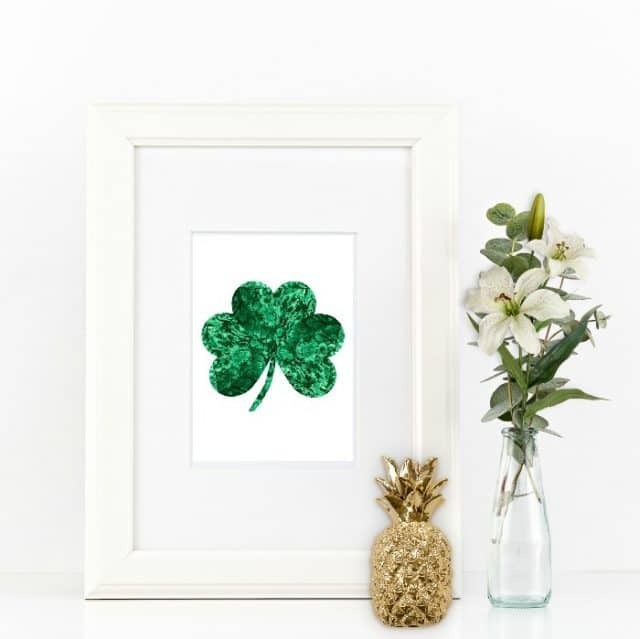 I’ve been wanting to decorate with malachite so I thought a St Patrick’s Day malachite shamrock would be a great way to add a modern touch of holiday decor. Sign up here to get complete access to the subscriber free printable art library! We took a few months off from the Inspired by DIY challenge but it’s back this year and with some changes. Last year we featured store knock offs but this year but this year we are thinking outside the box with iconic designers and styles! Our first challenge featured film maker Wes Anderson and I was blown away by all the projects. Check out our Wes Anderson inspired Dining Room plus 8 other bloggers’ DIYs! I mentioned last month I was starting a new series just for renters the third Wednesday of the month. Three other ladies joined me in sharing the best renter hacks for the living room. I also created a page with a resource list for renters decorating tips that will be updated often! With Spring just around the corner, I thought it was the perfect time to share my favorite organizing and simplifying decor tips in declutter your home decor. Keep holiday decor simple and fresh with modern St Patricks Day decor and DIYs. Last but not least, our first The Global Styler monthly series started and featured some amazing DIYs from my global eclectic friends Casa Watkins, A Designer at Home, and yours truly. You can look forward to more posts for Spring next month along with monthly series; The Best Renters Hacks, The Global Styler, and more!